The Church of England faces the prospect that last year’s controversy over its investment in Wonga could be reignited after the body that advises the church on the morality of its investments said the church should maintain its involvement with the payday lender. 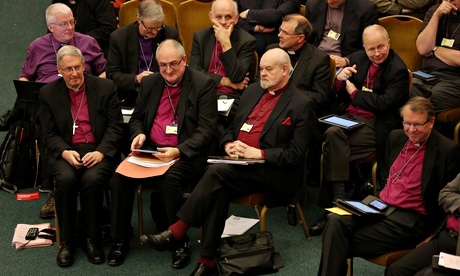 The church’s Ethical Investment Advisory Group (EIAG) embarked on a review after the Archbishop of Canterbury promised to put payday lenders like Wonga “out of business” without realising that his church’s financial arm had a stake in the firm, believed to be close to £100,000. James Featherby, the EIAG’s chairman, says in the review that the controversy “highlighted some misconceptions about ethical investment, and in particular that its objective is to achieve a morally perfect portfolio”. Featherby said the EIAG would usually only recommend divestment where it saw “no genuine desire for change”. While the body was in the process of tightening its recommendations regarding investment restrictions, he added: “Difficult choices remain, and it is inevitable that the investing bodies will from time to time graze their knees as they interact with a complex and ambiguous business world. This entry was posted in Uncategorized and tagged Archbishop of Canterbury, Church of England, General Synod, Wonga. Bookmark the permalink. 5 Responses to Would you Adam and Eve it? Jesus – temple – moneylenders. So they are not on the side of Jesus anymore? (A man cannot have two masters). OKaaay. Well they believe in God (presumably) so they know the consequences!